There has been a lot about Chess in Schools in the recent past. See http://www.chessbase.com/newsdetail.asp?newsid=7576 where there is a story about Kasparov Chess Foundation and Your Next Move. Today was interesting. I went to Brookhouse to take my daughter to take her music exam and guess what. 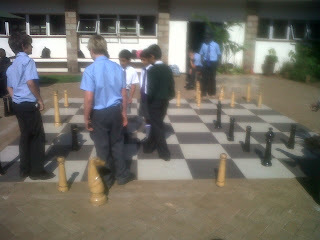 In front of the exam hall was a big out door chess set with a bunch of kids playing!! See the attached photo. The quality is not very good. Well what do you expect from a cheap Blackberry. Well I was glad that at least this school had put chess for kids to play at any time. The key thing about this set was that it was one that was made in Kenya and not an imported set which is great. We do not need imported sets when our great “Jua Kali” guys can do it. The other school that has an outdoor set is Peponi School in Nairobi. I forgot to find out what their chess club. Perhaps I will send them an email later and find out more information. Next article2011 Mombasa Open is on! !